뮌헨, 독일의 호스텔펜션 하이든 | 호스텔월드에서 예약하세요. cancellation free of charge normally 30 days prior arrival. Pre-payment and last changes/cancellation possible 14 days prior arrival. The following group types are not accepted by this hostel: Holiday with Friends, Business Trip, Stag/Hen/Bachelor Party If you have misrepresented the type of group you are booking for, your booking may be cancelled by the hostel." 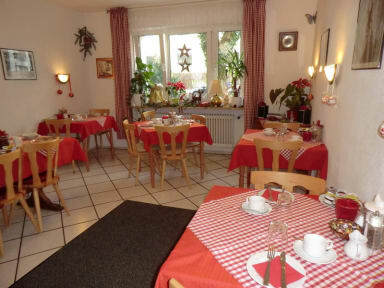 Family business, very quiet, private atmosphere, comfortable rooms, small garden, own parking place. Welcome in Hotelpension Haydn in Munich. We offer large breakfast, Wireless internet hot spot, Sightseeing tours, Shuttle service to the airport and to local fair, cleaning- and ironing service and bike rental. Parking places direct at the hotel are available as well. 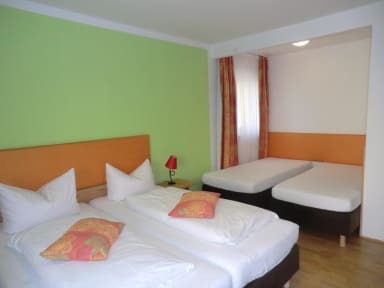 Hotelpension Haydn is located in the heart of Munich, city center, 10 min. from the famous Marienplatz or the main train station and 5 min. away from the October festival. Underground close to the hotel with direct connection to exhibition center (max. 15 min.) and the Olympia Park with concert hall (15 min.). Most our rooms have been modern renovated in 2014 and have a private bathroom, 2, 3 or even 4 beds or a sleeping sofa, as well as flat TV, hair dryer, minibar, shampoo, soap, towels. Payment upon arrival by cash, credit cards, debit cards (Visa, Mastercard, EC). This property may pre-authorise your card before arrival. Pet friendly - 6.00 EUR per day. Parking place - 7.00 EUR per day. Extra bed - 30.00 EUR per day. 적당한 수준의 싱글룸이나 더블룸을 찾으신다면 추천해요. 현대적이진 않지만 비교적 깨끗하게 룸이 관리되고 있고 숙박금액에 조식이 포함되어 있는데 나쁘지 않게 식사를 하실 수 있어요. 중앙역까진 15분 정도 도보이동이 필요한데 장단점이 있으니 참고하세요. 숙소 근처는 조용한 주거지에 가까워요.